"Looking for a quick and easy dessert? 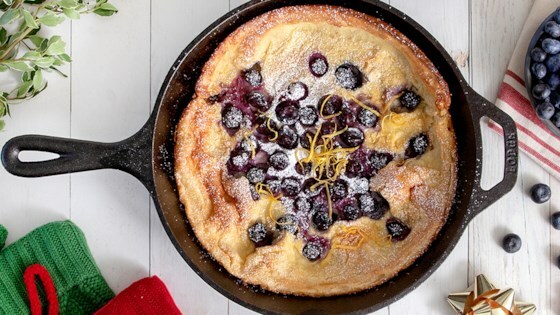 Try this blueberry-lemon Dutch baby recipe made with Stevia In The Raw®. Prepare batter in advance (and keep refrigerated) for a warm treat after dinner, or Christmas morning." Combine flour, milk, eggs, stevia, lemon zest, vanilla, and salt in a blender. Blend until smooth. Leave batter in the blender to rest for 30 minutes. Preheat oven to 425 degrees F. Place a 9-inch cast iron skillet in oven to preheat. When ready to bake, add butter to hot skillet, swirling to coat pan. Pour in batter, quickly sprinkle blueberries over the top, and bake until puffed and golden, 15 to 20 minutes. DIdn't puff much because of all the blueberries, but still tasted great! Super easy to make! Next time I make it I'll probably add more lemon zest cause only got a bit of that flavor.